What is the non-Biblical evidence regarding his existence around the time he is commonly thought to have lived? That is, are there other historically accurate documents from the time period which corroborate the biblical story or falsify it? Again, this question does not have anything to do with anyone's personal belief or disbelief, and certainly has nothing to do with divinity. It simply asks for a consideration of available evidence regarding the historical existence of a particular person by a particular name at particular place in time. Scientific evidences would be a little more difficult for any historical figure. For example using DNA or fingerprints to prove that someone existed in history is heading toward logically impossible. It seems you would need sample of biometric information from a person for comparison; but then you would, by definition, already know they existed. Chapter 9 of Gary Habermas' book "The Historical Jesus" addresses this question extensively. The non-Christian historical references mentioned above are all significant. What we need to understand first, though, is that there is no contemporaneous or documentary evidence for the existence of most ancient figures. That's the nature of our historical sources for the ancient world. So if the question is "Do we have good historical evidence that Jesus existed, the kind of evidence that historians take as conclusive when they're doing ancient history" then the answer is a clear "yes." One difficulty with the way the question is posed here is that it rules out any evidence coming from Jesus' followers. But that's not good historical method. For a relatively obscure figure from a backwater Roman province, the only sources you will find for the first several decades will come from the figure's own circle of followers. What we find is that within two decades of his death we have first- and second-hand accounts of Jesus' life and references to Jesus as a real person. (Paul writes in the late 40s and through the 50s AD.) It is important here that Paul and the other early Christians writing within living memory of Jesus don't treat his existence as a focus of argument or as something to prove. They display no defensiveness about it. Instead, it is just taken for granted both by Jesus' followers and by his detractors. This early evidence, then, seems widespread geographically (Paul in the Eastern Mediterranean, Peter and James the Just in and around Jerusalem, John perhaps in the Ephesus area of Asia Minor) and is uncontested by contemporaries. I find it particularly telling that Paul doesn't need to argue for Jesus' existence when he writes to the new Christian communities in Rome around AD 58. Paul clearly didn't found the community, has never been to Rome, and (based on how much of his teaching he has to defend in the letter) is regarded with some suspicion by Roman Christ-followers. Most scholars think that teaching about Jesus was brought independently to Rome by Jews returning from pilgrimages to Jerusalem or some similar informal route. Even so, Paul can take for granted their agreement that Jesus existed and was crucified . But we also need to look carefully at Tacitus and Josephus. Tacitus is writing in the second-century, true, but he is a meticulously careful historian. When he encounters dubious or unsubstantiated rumors, Tacitus is very clear with his readers that the evidence before him is suspect. So it is significant that Tacitus (less than a century after the events) does not signal any doubt. As for this passage being a Christian interpolation, there is no reason to say that except for prior doubts about Jesus. There is a danger here of "rigging the deck". If we dismiss evidence (without internal grounds) as fabricated, then what evidence could possibly be accepted? No, Tacitus is a very strong witness, even if he was writing two generations later. The so-called "Testimonium Flavium" by Josephus, on the other hand, is certainly the victim of Christian editing (for the reasons discussed here in other answers). But the general consensus among historians is that there was an original, neutral reference to Jesus here in Josephus that has been expanded and made more pious by later Christian scribes. I'll leave aside the detailed arguments here about the "seams" in the passage itself. More convincing to me is the fact that there are so few references to Jesus in early historians. If Christian scribes (who preserved all of these classical sources for us through late Antiquity and the early middle ages until they were "discovered" in Constantinople by Arab Muslims) did not make a habit of injecting references to Jesus everywhere, then we should be careful about assuming that this reference in Josephus is pure fabrication. What Christian scribes did do, though, is add to and elaborate on references to Jesus in "secular" sources to make them more pious. If that is what happened with Josephus, then we do have a non-Christian historian writing within living memory of the events about Jesus as a real figure. I am a biblical scholar and historian (PhD in Religious Studies from a secular public University in Canada, now tenured faculty at a Canadian Seminary). Every year I go to secular academic conferences to present and hear research papers from around the world. Arguments from consensus are dangerous, since the majority can easily be wrong. Still, it is significant that I have never met a colleague holding a faculty position in ancient history at a University who doubts Jesus' existence. This is certainly not because of public pressure (some of the same people are deeply iconoclastic) but because the evidence satisfies all the reasonable standards that we can expect for 90% of the ancient world. Anyone who spends her/his time working with ancient history comes to recognize quickly that the evidence for Jesus' existence is very good. Those who continue to question Jesus' existence are consistently people without academic training, whose work hasn't passed the peer review process that helps to maintain rigour. It tends to be journalists, documentary makers, amateurs writing a blog, or (at most) academics whose training is in an entirely different field (not in ancient history). My point is not that the historical academics couldn't (in theory) be wrong. It's that historians (even those much more skeptical than I) recognize that the existence of Jesus is as well attested as we can usually hope for in the ancient world. If we doubt Jesus' existence then certainly we must doubt, say, Pythagoras who left no writings and is only described by much later writers. There is also much better historical evidence for Jesus than for Gautama the Buddha, who was not treated in "outsider" accounts for much longer than Jesus. The trick, of course, is the term "verifiable" in the question. If one is looking for the kind of evidence that gives us measurable experimental data in the physical sciences, then no we won't be satisfied with the evidence. But if that is our standard we lose most of the past. The first Skeptics (of the post-Plato Academy) understood that we live in a world where the best we can usually do is probability, but that this doesn't make evidence or the degree of probability insignificant. So maybe what we can say is that the probability of Jesus' existence is much, much higher than the probability that he did not. This dating for Paul's writings is universally accepted among historians of the period and biblical scholars. See, e.g., Brown, Raymond E. An Introduction to the New Testament (New York: Doubleday, 1997), pp. 428-430. Of course, a neat reference is difficult when you're saying that something does not appear in a document. But take Paul's letter to the Corinthians as an example. He talks throughout about Jesus, and in 1 Corinthians 15:1ff. he offers argumentative evidence for his claim that Jesus was raised from the dead. But nowhere in the letter does he feel the need to argue in a similar way for Jesus' mere existence. His argumentative structure presumes that everyone in the audience takes it for granted. Similarly, in Matthew's Gospel we find that his resurrection narrative is geared to counter the claim that Jesus' disciples stole his body after the crucifixion (Matthew 28:11-15). The existence of Jesus, and his crucifixion by the Romans, is taken for granted. The same thing is evident in all of the NT books and the non-canonical Christian writings from the first to early-second centuries. Paul's geographic locations are evident from his authentic letters to churches that he founded: Galatians to various centres in Galatia (north-central Turkey), Philippians to Philippi (Macedonia), 1 Thessalonians to Thessalonica (Macedonia), Colossians to Colossae (Ionia in south-eastern Turkey--though some contest Pauline authorship of Colossians), 1 and 2 Corinthians to Corinth (at the top of the Peloponnesus of southern Greece). James is located in Jerusalem by first-hand accounts in Paul (Galatians 1) and possibly first-hand accounts in Acts (Acts 15 etc.). The Ephesian location for the disciple John is trickier and depends on second-century tradition. See the sections on each of these letters in Raymond Brown's introduction referenced above (Galatians, pp. 474-477; Philippians, pp. 483-485; 1 Thess, pp. 456-459; Colossians, pp. 599-601; Corinthian letters, pp. 511-515, 541-544; James, pp. 741-743; John in Ephesus, pp. 368-369). See Dunn, James D. G. Romans 1-8. Word Biblical Commentary 38A (Dallas: Word, 1988), pp. xlvi-xlvii. See, e.g., Romans 1:1-5; 3:25; and the allusions to crucifixion as the mode of Jesus' death in Romans 6. See the good treatment in volume 1 of Meier, John P. A Marginal Jew: Rethinking the Historical Jesus (New York: Doubleday, 1991), pp. 56-69. See Riedweg, Christoph. "Pythagoras." Pages 276-281 in Brill's New Pauly: Encyclopedia of the Ancient World (Antiquity v. 12; Leiden: Brill, 2008). See the section on 'The Historical Buddha' in Reynolds, Frank E. and Charles Hallisey. "Buddha" in Encyclopedia of Religion, 2nd ed. (v. 2; Detroit: Thomson Gale), pp.1061-1062. On Josephus' clear and obvious Jewishness, with no Christian inclinations, see e.g. Altshuler, David. "Josephus Flavius" in Encyclopedia of Religion, 2nd ed. (v. 7; Detroit: Thomson Gale), pp. 4957-4958. Tessa Rajak, a major authority on Josephus, says that "Josephus was always a Jew, and, throughout his writing life, was preoccupied with Judaism..." and by "Judaism" here she does not mean Jewish Christ-believers (Rajak, Tessa. Josephus: The Historian and His Society, 2nd ed. [London: Duckworth, 2002], p. 11). The infidels.org website has an article titled, "Historicity Of Jesus FAQ", which I believe is an even-handed treatment of the question. In that article, Scott Oser uses some of the same sources that BCooksey used in an excellent response on this page. Oser provides some additional information regarding the authenticity of those sources. The early Christian writer Origen claims that Josephus did NOT recognize Jesus as the Messiah, in direct contradiction to the above passage, where Josephus says, "He was the Messiah." Thus, we may conclude that this particular phrase at least was a later insertion. (The version given above was, however, known to Jerome and in the time of Eusebius. Jerome's Latin version, however, renders "He was the Messiah" by "He was believed to be the Christ.") Furthermore, other early Christian writers fail to cite this passage, even though it would have suited their purposes to do so. There is thus firm evidence that this passage was tampered with at some point, even if parts of it do date back to Josephus. The passage is highly pro-Christian. It is hard to imagine that Josephus, a Pharisaic Jew, would write such a laudatory passage about a man supposedly killed for blasphemy. Indeed, the passage seems to make Josephus himself out to be a Christian, which was certainly not the case. Did Tacitus really write this, or is this a later Christian interpolation? Is this really an independent confirmation of Jesus's story, or is Tacitus just repeating what some Christians told him? Some scholars believe the passage may be a Christian interpolation into the text. However, this is not at all certain, and unlike Josephus's Testimonium Flavianum, no clear evidence of textual tampering exists. The second objection is much more serious. Conceivably, Tacitus may just be repeating what he was told by Christians about Jesus. If so, then this passage merely confirms that there were Christians in Tacitus' time, and that they believed that Pilate killed Jesus during the reign of Tiberius. This would not be independent confirmation of Jesus's existence. If, on the other hand, Tacitus found this information in Roman imperial records (to which he had access) then that could constitute independent confirmation. There are good reasons to doubt that Tacitus is working from Roman records here, however. For one, he refers to Pilate by the wrong title (Pilate was a prefect, not a procurator). Secondly, he refers to Jesus by the religious title "Christos". Roman records would not have referred to Jesus by a Christian title, but presumably by his given name. Thus, there is excellent reason to suppose that Tacitus is merely repeating what Christians said about Jesus, and so can tell us nothing new about Jesus's historicity. There seems to be little or no argument that Tacitus was the original author of the passage and that it survives with no evidence of tampering. As Oser point out in his rebuttal to the second argument, we have no way of knowing how Tacitus got the information he wrote. It was obviously not first hand; Tacitus was born in 55 CE, and Jesus is believed to have left this earth around 27 CE, almost 30 years before Tacitus was born. It is believed that The Annals were written about year 117 CE, roughly 90 year after the death of Jesus, so it is highly doubtful that Tacitus would even have had access to anyone with first-hand knowledge of Jesus. For the sake of this argument, it is important to note that Tacitus does not name 'Jesus' as 'The Christ', and almost equally important, Tacitus does not mention Paul, Peter, or any other Christian leaders who would have been influential figures to Christians in Rome. Oser also provides arguments against the references to 'Jesus' or 'Christians' in the writings of Suetonius, Thallus, and Pliny the Younger. For sake of brevity they are not included here; you can follow the link to the infidels.org page to see those arguments. In personal discussions about the historicity of Jesus with other amateur scholars the theory has been posited that, like so many other hero myths, the figure we know as Jesus is based on deeds of more than one person and embellished to add greater credence to the claims made by proponents. This bit of trivia adds nothing to support or oppose the historicity of Jesus, it is, as I mentioned, only provided to obfuscate an already highly-debated subject. You can read part of a conversation between a believer and a skeptic, at www.christiananswers.net in an articled titled "Was Jesus Christ only a legend? ", that implies that some skeptics subscribe to the hero-myth theory about the historicity of Jesus. Here is an interview (LANG=DE) with the German Theologian Hermann Detering, who wrote the book „Falsche Zeugen. Außerchristliche Jesuszeugnisse auf dem Prüfstand“ (False witnesses, exochristian Jesus witnesses on trial). You can't take the bible for granted, because it isn't a historic book, but a statement of faith. It's hard to tell, when it was written and by whom. Most author names, mentioned, are wrong. Some parts of it are first mentioned in the beginning of the 2nd century, but from witnesses, who are themselves faked. The central statements of these witnesses about Jesus would fit on a postcard. These witnesses have been massively overestimated in the past. They where treated as if they were independent source. However, in reality, they where redacted by Christians, which is of little surprise, since copying at that time took place by handwriting. They didn't help much in the finding, whether Jesus was a historic person. In the Qumran text, he doesn't take place at all, and in the gnostic literature of Nag Hammadi, he is mostly a mythologic figure. The whole question of historic Jesus isn't new, and was debated before WWII in Germany, but abandoned afterwards. But today, there are new methods to analyse scriptures. With modern databases, it is possible to find favourite words for different authors. So were words and phrases found in texts, which weren't used in the time, the document supposedly origins. This shows, that the texts were redacted. An example is the „Testimonium Flavianum“ from Josephus. He mentions Jesus as a wise man. But early, Christian literature from that time doesn't mention that witness, as one would expect. The christian historian Eusebius is the first to mention the witness of Josephus. Unfortunately, his wording and phrases are very similar to the wording and phrases of Josesphus. The roman historian Sueton mentions a man called 'Chrestos', who shall, under imperator Claudius (reg. : 41-54) , agitated the Jews of Rome to furor. Then Claudius displaced the Jews from Rome. But Jesus is said to died under imperator Tiberius (reg. : 14-37), and Christus is not Chrestos, which was a common name for slaves in Rome. Then there is the Roman historian Tacitus, who wrote about the burning of Rome under Nero, as filmed in Hollywood. Isn't this a witness of early prosecution of Christs? Well - early Christian scriptures don't talk about this important event. Only later writings from about 300-400 BC talk about it, and again, the words and phrases of the reporting Tacitus, and his 'source', Sulpicius Severus are very similar. Today, historians doubt, that Nero burned Rome. So the conclusion is not only, that the existence of Jesus is questionable, but the existence of an early Christianity in the first century too. First witnesses are from the mid of the second century, namely imperator Marc Aurel. ... the birth of Jesus happened during the kingdom of Herodes. And it came to pass in those days, that there went out a decree from Caesar Augustus, that all the world should be taxed. And this taxing was first made when Cyrenius was governor of Syria. According to our today knowledge, the census in Syria took place at 6 or 7 AD. From the writings of Flavius Josephus, a second census seems impossible, since the census was unknown to the Jews. More: Their province didn't belong to Syria before 6 or 7 AD. But Herodes died 4 BCE so there is a 10 to 11 year gap between both possibilities. Some authors have speculated, that Luke might have confused Herod the Great with another Herod, Herod Antipas, but the gospel of Mathew clearly speaks about Herod the Great. So the story of the birth is inconsistent with other historically more reliable material. Emil Schürer, A History of the Jewish People in the Time of Jesus Christ, 5 vols. New York, Scribner’s, 1896. Gerd Theißen, Annette Merz, Der historische Jesus: ein Lehrbuch, (Vandenhoeck & Ruprecht, 2001), 149-50. Almost all reputable historians believe that Jesus did exist. Why they believe this I will explain below. To be absolutely clear, when we say Jesus did live, we are not saying that everything or even most of the things said about him in the Bible is true. Even ignoring the supernatural elements, the gospels contain internal contradictions, so we are absolutely sure they are not 100% reliable. What we say is that the myth of Jesus originated from real historical person. Kind of like the myth of Santa Claus originated with a real person, the bishop Nicolaus of Smyrna which was later sactified as Sct. Nicolaus. Compare this this to say Jupiter which we consider a purely mythological figure. The outlandish claims regarding Jesus (walked on water, resurrected the dead etc.) cannot be taken as evidence that he is fictional. If we take Alexander the Great, multiple legends grew up around him - he was the son of Zeus, his sister was a mermaid etc. This just shows that when a figure becomes revered, legends will form. No historians in their right mind would deny that Alexander was historical. Stripping away all the legends around Alexander there is still a historical core which is more likely to be true than to be made up. I'm going to explain why historians consider the same to be the case for Jesus. So what evidence is there for Jesus as a historical person? We have no first-hand or contemporary sources to the life of Jesus and we have no archaeological remains to prove his existence. And this is not surprising - this is the case for the vast majority of pre-modern historical figures, including people who was much more famous in their own time than Jesus. Take someone Alexander the Great again, one of the most important figures in History. We have no first-hand sources and no remains. The best sources we have are written hundreds of years after his death. Even then, given the available historical evidence we assume Alexander existed, since a lot history is impossible to explain otherwise (and his invention would have required a vast conspiracy among historians in antiquity). So the only mention of Jesus is really talking about his brother. And it doesn't give us any information about Jesus, except that somebody thought he was the Christ (ie. the promised Messiah), which we already knew. Nonetheless, given this paucity of non-biblical sources, almost every reputable historian believe the Jesus did live. Why? Because of the evidence in the Gospels. It might seem bizarre that the gospels can be taken by historians as evidence for anything, since they are clearly religious and not historical writing. But this is actually the case for almost every source we have from antiquity. You explicitly ask for non-christian sources. I'll asume you do this based on the assumptions that the Christian sources (i.e. the Gospels) are inherently more unreliable than other sources. Sure, the Bible is biased and makes outrageous claims about the miracles and divinity of Jesus - but be aware that all ancient sources are unashamedly biased and filled with with outrageous claims by modern standards. ...he goes on to describe Adam and Eve, the ark of Noah and so on. Even then Josephus is considered one of the most important and reliable historical sources. We just have to read it all with a critical mind. "Christus, from whom the name had its origin, suffered the extreme penalty during the reign of Tiberius at the hands of one of our procurators, Pontius Pilatus, and a most mischievous superstition, thus checked for the moment, again broke out not only in Judæa, the first source of the evil, but even in Rome, where all things hideous and shameful from every part of the world find their centre and become popular"
Clearly he is at least as biased as the Christians, just with the opposite bent! Bottom line: Any ancient text should be read with a heavy dose of source-criticism. The gospels are actually relatively strong sources because we have four semi-independent account. The inconsistencies between the gospels have been a source of embarrassment for the church, but for the historian they are a godsend: They allow us to through textual analysis determine the age of various parts of the narrative and then estimate how it developed over time. The gospels taken together are actually pretty good source material compared to what we have about most other pre-modern figures, including kings and emperors, believe it or not. Now if we take the gospels and strip away anything slightly supernatural, we are left with a pretty plausible narrative. A Jewish guy walks around in Galilee and Judea and talks in parables and preaches about the coming Kingdom of God. He gains a bunch of followers (a cult would we probably say today) and is rumored to be the long awaited Messiah. The Romans consider this cult a threat, and execute the leader. Not only is this pretty plausible, it actually happened more or less like this several times. The historian Josephus describes several such "mad prophets" and even a similar episode where a guy claiming to be the messiah gets a bunch of followers, leads them into the desert where he claims to want to part the Jordan river (like Moses parted the Red Sea) ... but before he gets that far is slaughtered by Roman soldiers along with his followers. The only really unique thing about Jesus compared to these other prophets and cult-leaders, is that his cult survived his death and turned into a major religion in the Roman Empire. But this seems to be more due to Paul, which transformed an obscure Jewish sect into a religion acceptable to non-Jews and started missioning among the polytheists in the Roman empire, at at time that were ripe for Monotheism. Now lets examine the alternative hypothesis, that Jesus is a purely fictional or mythological figure. Even if that is the case, someone wrote (or composed, since it was initially an oral tradition) the sermon on the mount, the parables and so on, and created the narrative of his ministry, followers, crucifixion etc. This theory is really hard to believe, since the story about Jesus simply do not make sense as constructed fiction. There are some urban legends circulating in dark corners of the internet about parallels between Jesus and the Horus myth or the Bacchus myth or some other myths which is supposed to the be "true origin" of the Jesus myth. Forget about this. Sure, there a few parallels across religion (ie. resurrection is a recurring theme, miracles surrounding the birth of demigods etc), but the vast majority or the religious content of the gospels are very specific Jewish culture. There are numerous references to mosaic law and the OT prophets, discussions about interpretations of the laws and tradition, references to temple cult, references to groups like Pharisees and Sadukees and references to the roman occupation. If Jesus is fictional, the author was without a doubt a first century Jew. However if we look at it as a work of fiction it has some strange strange choices. If the purpose of the narrative is to show that Jesus was the Messiah / the Son of God, then why invent the story that he was crucified? Why don't say that he killed a thousand Romans with a flaming sword and then was lifted into the heavens by the hand of God or something like that? This is extremely embarrassing. In the last moment he looses faith, thinks God has abandoned him, and dies with a whimper. Even Jim Jones or David Koresh did not lose faith like this! And people around him does not understand what he is saying and are making fun of him. Now the story is less embarrassing. No crying or loosing faith. Instead Jesus bravely accepts his fate. Now, not only does Jesus bravely accept his fate, it actually turns out it was part of the big plan all along! And the sponge-guy is not taunting Jesus anymore, but rather offering the sponge as an act of grace. The whole scene is just so much more dignified and meaningful. It is quite easy to see how the narrative could have developed like this. First the crucifixion and the pitiful death of Jesus is an embarrassing fact. But over the following decades (it is assumed to be about 40 years between Mark and John) it is re-interpreted (or spun as we would say today) to actually becoming a meaningful event which shows the greatness of Jesus, and was planned all along. Now consider if it was a fictional account. it makes no sense to make up such an embarrassing end for Jesus (which the Christians later had to spin heavily), if the point of the story was to convince people that this guy was God! The case for the purely fictional Jesus simply does not make sense. Tl;dr: Jesus most likely were a real person. And provides numerous references. The "Jesus was a myth"-theory is basically a fringe theory at this point. What is still controversial is exactly how much of the gospels actually happened and how much is later legends. This is an ongoing discussion, and a far more complex question. There is actually quite a few references to Jesus in books from antiquity. 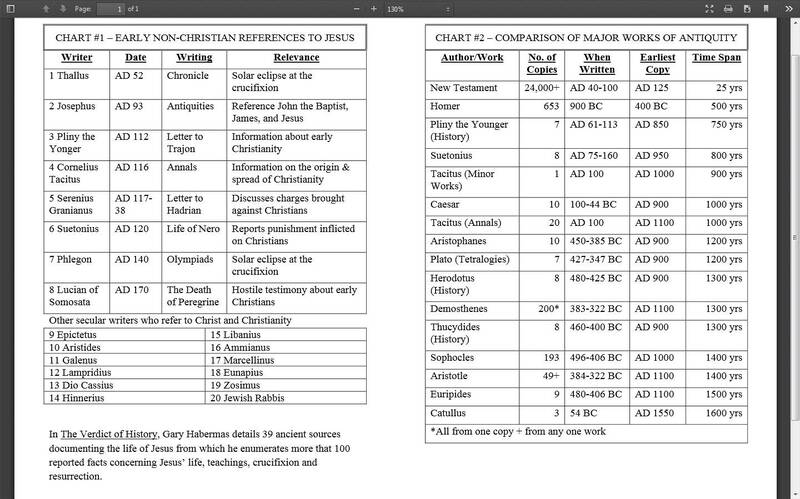 The second chart also puts the New Testament in comparison to other ancient works. Are there any extra-biblical validations of his existence around the time he is commonly thought to have lived? Is there any accepted archeological evidence to support claims in favor of his living at this time? The author claims this is historical (documentary) evidence at least of Jesus being crucified. Using only the information gleaned from these ancient extra biblical sources, what can we conclude concerning the death and resurrection of Jesus? Can these events be historically established on these sources alone? Of the seventeen documents examined in this chapter, eleven different works speak of the death of Jesus in varying amounts of detail, with five of these specifying crucifixion as the mode. When these sources are examined by normal historical procedures used with other ancient documents, the result is conclusive. (91) It is this author’s view that the death of Jesus by crucifixion can be asserted as a historical fact from this data. This conclusion is strengthened by the variety of details which are related by good sources. As mentioned often, a few of the documents may be contested, but the entire bulk of evidence points quite probably to the historicity of Jesus’ death due to the rigors of crucifixion. The ancient references to the resurrection are fewer and somewhat more questionable. Of the seventeen sources, seven either imply or report this occurrence, with four of these works being questioned in our study. Before answering the issue concerning Jesus’ resurrection, we will initially address the cognate point of whether the empty tomb can be established as historical by this extra biblical evidence alone. There are some strong considerations in its favor. Here is a very interesting quote by an often quoted skeptic New Testament scholar on the issue of mythicism. I have now quotes to highly regarded New Testament scholars both Christian and Atheist who both claim that Jesus most certainly did exist. So if this is not enough to put this issue to bed then I fear nothing will. Not the answer you're looking for? Browse other questions tagged history jesus-christ . Is there historical evidence for Christ's resurrection?